Mrs. Debra Elaine Pruitt Ayers, age 65 of Mize Road, Toccoa passed away Tuesday, January 29, 2019 at her home. A daughter of the late Fred and Pauline Patterson Pruitt, she was born January 18, 1954 in Stephens County, Georgia where she lived all her life. She was a graduate of Stephens County High School. She received her Bachelors Degree from Brenau College, later receiving her Masters Degree and then received her Specialist Degree from Clemson University. 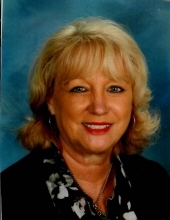 She was employed with Stephens County School System and later retired from the Banks County School System as an Administrator. She was of the Baptist faith and attended the First Baptist Church. She was a member of the Delta Kappa Gamma Education Society. In addition to her parents, she was preceded in death by a sister, Fredda King, by two brothers-in-law, Frankie Payne and Elwood Eades and by her mother-in-law, Hazel Ayers. Survivors include her husband of the home, Dan Ayers; two sons and daughters-in-law, Jamie and Susanne Ivester of Good Hope, Georgia and Brett and Dottie Ivester of Toccoa; four grandchildren, Evan, Lizzie, Brentley and Emma; two sisters, Linda Payne of Toccoa and Becky Eades of Moulton, Alabama; sister-in-law and brother-in-law, Anne and Billy Rogers of Eastanollee. Funeral services will be Thursday, January 31, 2019, 3 O’clock p.m. in the Hillcrest Chapel of the Acree-Davis Funeral Home with The Reverend Jerrell Beatty and The Reverend David Ritcey officiating. The following gentlemen will serve as pallbearers, Austin payne, Scott Payne, Evan Ivester, Brentley Ivester, Cooper Howard and Tanner Howard. The family will be at the home on Mize Road and will receive friends at the Acree-Davis Funeral Home on Wednesday from 6 p.m. until 8 p.m. Online condolences can be left for the family at www.acree-davisfh.com. Interment will follow in the Stephens Memorial Gardens with the Acree-Davis Funeral Home in charge of the arrangements for Mrs. Debra Ayers. To send flowers or a remembrance gift to the family of Debra Elaine Pruitt Ayers, please visit our Tribute Store. "Email Address" would like to share the life celebration of Debra Elaine Pruitt Ayers. Click on the "link" to go to share a favorite memory or leave a condolence message for the family.